Construction earthworks - digging under a foundation, swimming pool or pond, a trench for an autonomous country house sewer, drainage system or water cottage. In organizing the excavation is very important to assess the volume excavate. The cost of excavation consists of excavation of the trench or trenching and removal of soil. It is necessary to plan the movement of topsoil layer of the earth for future use in the garden or yard. Marginal part of the soil used for leveling the site, feedback podsypku foundation or are taken off-site. Places for removal of soil is determined in advance. Also note that the prices for 1 cubic meter of excavation often increases with the depth of the work. So the price from the surface to a depth of 1 meter and 1 meter from the deeper and may vary even twice. Earth moving frequently as a separate item of expenditure. In order not to be unexpected expenses, negotiate everything in advance with the contractor. Consider the stock in the amount of excavation for formwork for pouring the foundation. Each of these approaches have their pros and cons. When working by hand excavation can be performed more accurately. With cheap labor, and small amounts of the final cost of production by hand excavation may be less than renting an excavator and other machinery. Easier to implement control the size and geometry of the pit. However, significant amounts of soil and in the speed of the backhoe is often wins. In any case, the decision depends on you. First you need to mark a place in the pit or trench. 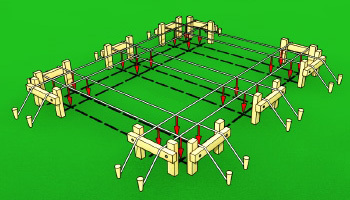 To do this, on the ground with pegs and a thin cord, refer to the worksite. To control the geometry of the measured two diagonals of the future of the pit - they must match. However, this is an unprofessional way and is suitable for marking trenches or relatively flat land. For more accurate design earthworks on the following technologies. At some distance from the proposed excavation dig in wooden posts, in groups of two pieces (castoffs). They fasten the board horizontally, which pull cords. Boards try to fix on one level with each other. By moving cords, achieve exact marking. These cast-offs in the future use and for precise strip foundation formwork. Greatly facilitates the work level, theodolite, laser tape measure or laser level. In a weak field or considerable depth of excavation pay special attention to the safety of the excavation. In this case, the wall of the pit do not strictly vertical, but with a bias - to prevent the shedding of the soil. The sides and bottom of the pit level control and rail long enough. For the exact angle of 90 degrees is one step. Triangle with sides 3:4:5 m (or with sides that are multiples of these figures) has an angle of 90 degrees. 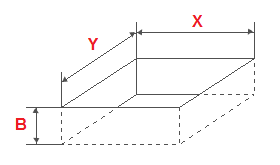 Lay on one side of the angle of 3 meters, on the other - 4 and the distance between the points must be exactly 5 feet.